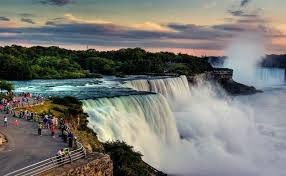 Niagara Falls is the collective name for three waterfalls that cross the international border between the Canadian province of Ontario and the USA’s state of New York. They form the southern end of the Niagara Gorge. From largest to smallest, the three waterfalls are the Horseshoe Falls, the American Falls and the Bridal Veil Falls. The Horseshoe Falls lie on the Canadian side and the American Falls on the American side. They are separated by Goat Island. The smaller Bridal Veil Falls are also located on the American side, separated from the other waterfalls by Luna Island. There are various attractions that people can enjoy in Niagara Falls, six of them are described here. Air terjun Niagara adalah nama bersama untuk tiga air terjun yang menyeberangi perbatasan international antara Provinsi Ontario di Kanada dan New York Amerika serikat. Mereka membentuk ujung dari Niagara Gorge. Dari paling besar ke paling kecil, tiga air terjun adalah air terjun Horseshoe, Air terjun Amerika dan air terjun Bridal Veil. Air terjun Horseshoe terletak di sisi Kanada dan air terjun Amerika terletak di sisi Amerika. Mereka dipisahkan oleh pulau Goat. Sebagian kecil air terjun Bridal Veil juga terletak di AMerika, dipisahkan dari air terjun pulau Luna. Ada banyak daya tarik yang orang orang dapat nikmati di air terjun Niagara, enam diantara mereka dideskripsikan disini. The first to enjoy in Niagara Falls is Cave of the Winds. This attraction helps people get closer to the falls and go face-to-face with the pounding waters of the Falls. People can get soaked on the Hurricane Deck where they are just feet from the thundering waters. Waterproof clothing and sandals are provided. A trip at night when the Falls are illuminated in a rainbow of color is really amazing. The second charm is Maid of the Mist Boat Tour. It is a world-famous scenic boat tour of the American and Canadian Falls for about a half-hour ride. People may access the tour via the Observation Tower elevator at Prospect Point in the state park. The boat operates mid-May until late October. Daya tarik kedua adalah Tur Maid of the Mist Boat. Ini adalah pemandangan kapal yang terkenal di Amerika dan Kanada selama setengah jam. Orang orang boleh mengakses tur melalui menara pengamatan di Prospect Point di taman umum. Kapal ini beroperas mulai dari pertengahan Me hingga Oktober. The next to visit in Niagara Falls is Niagara Adventure Theater. Here tourists may enjoy the most powerful and involving film experience that brings reality to life on a 45 foot screen. Audience members are given the priviledge to discover the thundering Falls from a completely new and exhilarating perspective, and plunge over them. The theater shows hourly and free multi-language headsets are made available. Tempat selanjutnya untuk dikunjungi di Air Terjun Niagara adalah Teater Petualangan Niagara. Disini turis dapat menikmati pengalaman film paling kuat dan melibatkan yang membawa kayalan ke kenyataan pada layar setinggi 45 kaki. Anggota penonton diberikan hak untuk menemukann gemuruh air terjun dari sudut baru dan menyenangkan, dan menyelupkan diatas mereka. Teater mempertunjukkan selama satu jam dan headset dengan beragam bahasa juga disediakan. Niagara Science Museum is another place to visit. It is a sanctuary for the preservation and appreciation of old science instruments and philosophical apparatus. The fifth point of interest is Niagara’s Wax Museum of History. Here, life-size wax figures portraying dramatic history of Niagara Falls are presented to guests. They can see Fort Niagara Scene, Indian Village, old store, blacksmith and barber shop scenes and how electricity is made. Wax figures of Julia Roberts, Princess Diana and many more are displayed here, too. Museum alam Niagara adalah tempat lain untuk dikunjungi. Ini adalah cagar alam untuk pelestarian dan penghargaan intstrumen alam tua dan filosopi apparatus. Daya tarik kelima adalah museum sejarah Lilin. Disini, patung liln seukuran mahluk hidup menggambarkan sejarah dramatis dari air terjun Niagara disajkan ke pengunjung. Mereka dapat melihat pemandangan Fort Niagara, desa Indian, toko tua, pandai besi dan pemandangan tukang cukur dan bagaimana listrik di buat. Patung lilli mengambarkan Julia Roberts, Puteri Diana dan banyak lagi dipamerkan disini. Finally, people can also enjoy Rainbow Air Helicopter Tours above and around the American and Canadian Falls. The tours start from downtown, next to the entrance to the Rainbow Bridge, and open from 9am to dusk when weather permits. The tours operate every day from second weekend in May until October 31st. Akhirnya, orang orang dapat menikmati Tur Rainbow Air Helicopter diatas dan mengelilingi air terjun Amerika dan Kanada. Tur tersebut memulai dari pusat kota, selanjutnya ke pintu masuk jembatan Rainbrow, dan dibuka dari pukul 9 pagi sampai senja ketika cuaca memadai. Tur tersebut beroperasi setiap hari dari minggu kedua bulan Mei sampai 31 Oktober. 1. Where is Niagara Falls located? 2. Mention the three waterfalls that form the Niagara Falls. 3. What can people enjoy in the Cave of the Winds? 4. Can people ride on the Maid of the Mist Boat Tour in January? 5. Where can people watch a film of the thundering falls with completely different background? 6. Can the tourists enjoy the film in their own language? 7. What is kept in Niagara Science Museum? 8. What is shown in Niagara’s Wax Museum of History? 9. Where can people see the story of how electricity was made? 10. Is it possible for people to have Rainbow Air Helicopter Tours at night? 11. If you had an opportunity to visit Niagara Falls, which attraction would you visit first? Why? 12. Can you find a place of similar beauty to Niagara Falls in your area? Tell your classmates about the place. Complete the following sentences using the words in the box. Remember to use the correct forms. 1. Waves are ______________ against the pier. You can hear the sound very clearly. 2. In the morning, the small town is covered in __________. 3. Explore Cheddar _______________ through photos in the internet. They inspire you to come and visit. 4. Her shoes got ___________ as she walked through the wet grass. 5. Don’t forget to bring your _____________ jacket. It’s dark outside, it’s likely going to rain. 6. Somerset ______________ help her forget her complicated problems. 7. Christiano Ronaldo came to Bali to campaign for the ______________ of the environment. 8. The street lights go on at ___________ Without the lights, car drivers cannot see the traffic in front of them. 9. Look at that side. An ________________ sign flashed on and off. 10. This is a region of ______________ beauty. All areas are covered with trees; clean water flows uninterrupted, and fresh air fills the sky. 11. I remember having an ___________ walk to Mount Bromo two years ago. 12. The Rainbow bridge ___________ Niagara river. 13. On her last vacation, her car swerved and __________ off the cliff. 14. The ______ of the nature reminds him of God’s greatness. 15. Tropical forest in Borneo is the largest wildlife __________ in Indonesia. 4 Tanggapan untuk "Materi Bahasa Inggris SMA/SMK Kelas 10 Kurikulum 2013 tentang deskriptive teks Visiting Niagara Falls dan terjemahannya "